Complete display kit bundle including lights and a convertible case. Complete lightweight and portable bundle for your next event. Nobody likes a boring exhibition or trade show display. Don’t be that business! 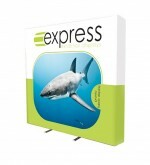 Instead, create a visually amazing display for your event with our range of fabric display stands. Branding has never looked better, with pin-sharp graphics your fabric display will be difficult to miss. Best of all, they’re super portable. Light enough to carry easily in transport cases, the stands require no tools for assembly and can be put together in minutes – with numbered frame sections to make assembling super easy. 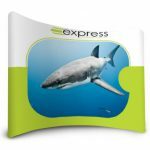 Is a fabric display stand right for you? Our latest high-tech methods of printing and materials used means they come in many shapes and sizes, so you can create a stunning backdrop perfect for any space, at any location. You won’t spot any seams in your graphic because there aren’t any. The fabric itself is seamless, and fits the frame like a pillow case that zips closed for tension. Graphics can also be washed and ironed using a cool setting to keep your display looking as good as new, for longer. 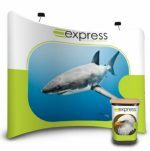 If you’re looking to stand out from the competition at your next trade show or event, a fabric display is the perfect choice. Your designs will be reproduced pixel-perfect on fabric thanks to our technically advanced printing process. Printing using a dye-sublimation process, the ink is pressed into the fabric itself – meaning your graphics won’t peel or fade over time. We are experts in large format dye sublimation printing. But don’t worry about the complicated stuff, just marvel at your finished spectacular fabric display stand. Once put together in minutes, the fabric graphic is stretched over the flexible aluminium frame. After your event is over, simply unzip and slide off the fabric graphic. You can even put it through a cool machine wash and iron it. They’ll look flawless time and again. Just send your stunning designs to us and we’ll do the rest. If you’re in need of artwork assistance, we can create this for you. Working with one of our friendly artwork technicians your brief can be brought to life. We can create awesome graphics that show-off your logo or come up with anything else that fits your needs perfectly. It’s important to us that you make the most of the opportunity that fabric display stands present. 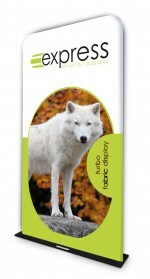 Why choose us for fabric displays? 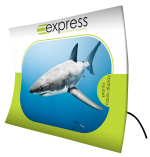 We’re experts in large format printing, and a trusted UK supplier of exhibition stands. With a dedicated account manager, you’ll be in safe hands from the quote stages all the way to delivery and assembly. For more information or custom requirements, please get in touch with a member of the team today on 0808 250 8799.